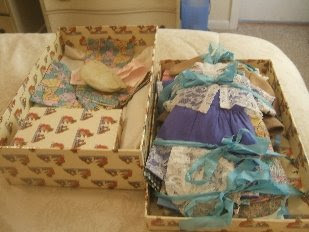 This is my Bleuette's Wardrobe "Trunk"
I have a pink ribbon with velcro to keep it closed. 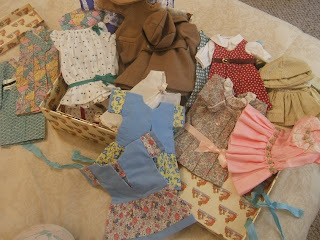 This next picture shows how I tied all their clothing into the lid of the trunk. 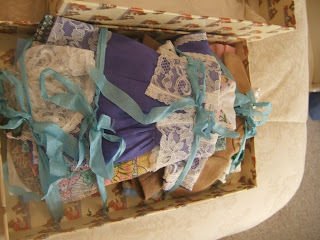 You can see how I have untied the ribbons and can now look through their outfits, trying to decide which one Dalfina, Maggie, Anna, Suzette, Daisy, or Bobbette needs to wear! 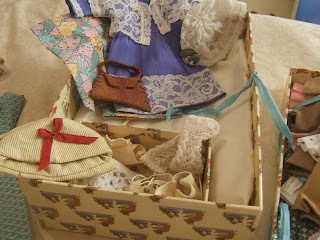 I have a little box to hold shoes, socks, ribbons, and other little items that might get lost! 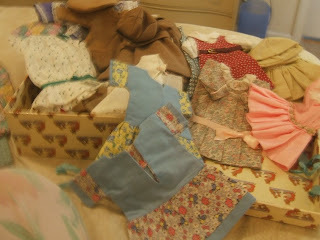 So many outfits, and still needing more! A favorite outfit with a belt. 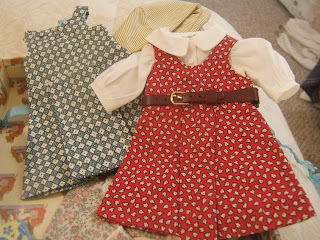 The little blouse is very dainty and entirely handsewn out of Imperial Broadcloth. We've finished looking through the outfits, so the ribbons are tied back. 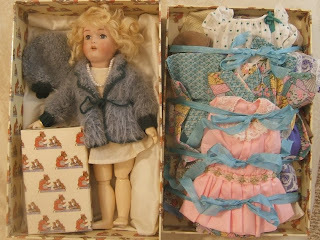 Today Daisy will be traveling in the wardrobe trunk. She is resting on beautiful satin that is nice and soft with cotton batting as her padding. 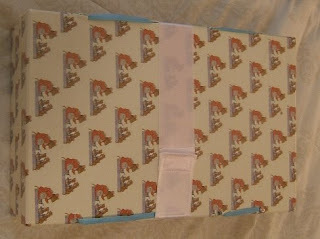 Both the bottom and the top of the trunk is lined with padded satin. 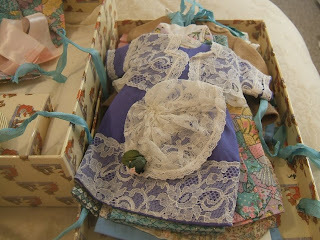 I do have ribbon ties to make sure my doll does not move when she is traveling!